Sitting down to write this in mid-winter it is pleasant to think of spring. And what flowers epitomise that season more than our native species of Primula? Their very name (from the Latin primus = first) bespeaks their early blooming - primroses (Primula vulgaris) appearing in March and cowslips (P. veris) in April. Natives of calcareous grassland, cowslips have always grown in and around Stapleford parish chalk-pit which adjoins Magog Down. On the Down itself they did not survive the years under arable farming but they have been very successfully re-introduced. Look for them, in particular, on the western slope of Little Trees Hill. For such a pretty flower the cowslip has an unfortunate name - from the Anglo Saxon cu-slippe or cu-sloppe meaning ‘cow dung’, it being believed that they grew best where cattle had so fertilised the meadows. You might prefer the local East Anglian name of ‘paigle’, or even the West Country ‘lady’s keys’, ‘keys of heaven’ or ‘St. Peter’s keys’. The latter names (reflecting the resemblance of a the cluster of flowers to a bunch of keys) have an interesting history. In the old Norse times the flowers were dedicated to Freya and symbolised the keys to that goddess’s treasure palace. Christianised to ‘Our Lady’s keys’, they eventually came to be associated with that most famous of key-holders, St. Peter. A north European legend tells that they sprung up where Peter, shocked to find that a duplicate had been made, dropped the key of Heaven to earth!! It is said that the idea behind the reference was the belief that the flower could magically improve the complexion. One old writer noted that ‘Some women ... sprinkle ye floures of cowslip with white wine and ... wash their faces with that water to drive wrinkles away and to make them fayre in the eyes of the world rather than in the eyes of God’! Somewhat less whimsically the flowers were used in folk medicine for strengthening the nerves and brain, relieving restlessness and insomnia and easing pains in the head. According to Culpepper, the roots ‘ease pains in the back and bladder’ and the leaves ‘are good in wounds’. 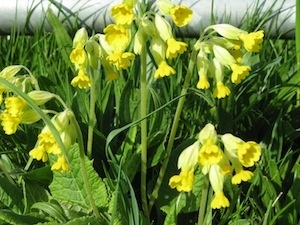 Cowslip wine was once highly regarded both as a beverage and as a medicine, it being thought particularly beneficial (in small doses) as a palliative against the ailments of childhood. It is also reckoned to be pleasantly soporific - hence the poet Pope’s resolve to ‘drown all high thoughts in the Lethe of cowslip wine’. The delicate aroma of cowslip flowers, derived from the aromatic compound anisic aldehyde, has been likened to the scent of a baby’s breath. 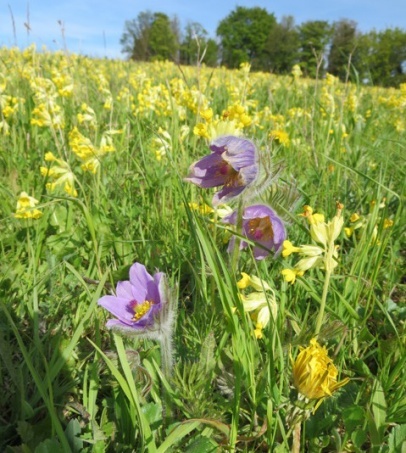 They have been made into conserves, eaten (sugared) as a salad, and even used for flavouring minnows - Isaak Walton recommending that the little fishes should be ‘fried with the yolks of eggs, the flowers of cowslip, and of primroses, and a little tansy’. The young leaves have also found a place in the kitchen, both as a salad vegetable and, mixed with other herbs, to stuff meat. Cowslip seed is readily available in the shops so if you want to drive away wrinkles, drown high thoughts, or flavour minnows, you can grow the means to do so in your back garden. But don’t stint on your seed order - to make four pints of wine you’ll need half a gallon of flowers!